This past week, I got a text from a former neighbor, Cheryl, whom I dubbed Cheryl Meryl, she was in town for a few days and wanted to stop by for a minute. I can’t tell you how happy it is for me to see my Cheryl Meryl. She is so unique and beautiful. She looks how I think Olive Oyl would look, tall and lanky, beautiful neck, a face that doesn’t take life too seriously — when she walks her mind and head leads her long legs, and often her hands will be behind her back, and that’s my Cheryl Meryl. Cheryl Meryl loves to cook and loves to cook healthy. When she was still my neighbor, she made a dish with tofu and said it tasted just like hamburger. Um, nope, it didn’t, and I told her that, and she laughed that incredible laugh. And now I do love tofu in Japanese fare, but not as a substitute for meat, hello? I’m a country gurl. They moved just a couple of years after we moved into the neighborhood, but when I see her it’s like I saw her just the day before. And that face, I can’t take my eyes off it, because it’s so Cheryl Meryl. And she speaks without any filter at all, just tells it like it is, and I love that because everything is understood, this is her life and it’s complicated, and it’s a bit lonely and random, and it’s free-spirited and somehow very lucky. The girl who doesn’t take things too seriously, has been given some pretty serious things in life, most notably, when her hubby had cancer and she took care of him until he passed away a few years ago. And now she lives in a cottage in her home town in Iowa, and she knows everyone, and everyone knows her, and she’s making it work, and getting out and about, and she touches the lives of those in need just by being Cheryl Meryl. And then someone will leave her money or a car, and she invests and cashes stuff in and travels to see her kids or her friends and she lets life lead her like she walks, head long, striding with her hands behind her back. But, the best thing about Cheryl Meryl, and one of the most treasured gifts she ever gave me was a lesson in hugging. She gives full on body hugs, and when I hug her, I just melt like butter and she said, “Never end the hug until the one who started it ends it.” I loved that, and I have been a better hugger since that lesson. And when we hug, we really don’t know who started it, because it’s just like “Here you are!” and long arms reach around each other’s bodies, and we laugh and we hold on, and it fills us up, you know? It’s like from the tips of our toes to the tops of our heads, we are “full up” with love. It’s one of those amazing experiences in life, to know someone so briefly, but to feel them inside your body as if you are carrying them with you. I need to get that hug whenever she’s in town so I can be “full up” with Cheryl Meryl, and those hugs I give now, they are like Cheryl Meryl hugs, and they fill me up from everyone, and I make sure to hug long enough to fill them up, too, and so, because of her, I am full up of so much love from so many people. I suggest you try it sometime. Go ahead and hug someone close, and don’t let go until you wanna. Yes, that’s the thing about Cheryl Meryl hugs, they aren’t the “proper 3 second hugs” , or the “one arm hugs” (give us a break!) they are the deep, loving, holding on until the hug is finished hugs. Once you try it, you’ll know what I mean, and if either of us see you? Yah, we’ll be hugging you and you’ll be “full up” with love. < Mrs Korwin, Kids and Kidneys…Pass it on. Yep I think Cheryl-Meryl taught you to hug very well……. I love reading you! Intrigue, tears, laughing, feeling my heart…thank you, AGAIN. And I find it intriguing that you find intrigue, AND am happy that you stop In at just the right moments for my heart. Thank YOU, Cara!!! How fun! I am honored! I will check out your page, thanks so much, Ellie! I just have to figure out how to put them on my blog. Hmmm. It might take a little time. So new at this, but have over 5000 hits and that’s amazing! I have accepted. Answers on my page. 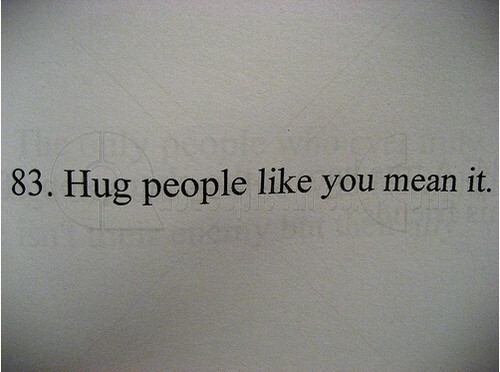 Hugs and <3.